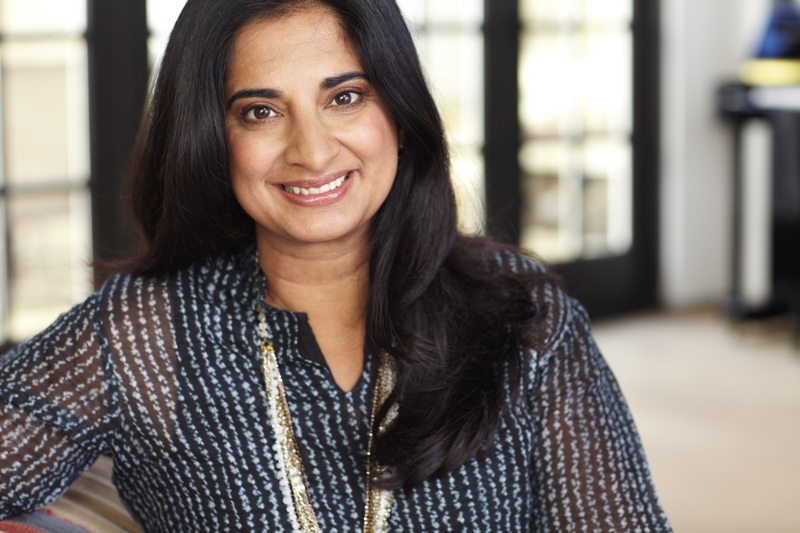 I spoke with Mallika Chopra to learn how she took these practices which she learned as a kid (she is the daughter of famed Deepak Chopra, after all), and disseminated them into the lives of her family. Now she’s making it easy for the rest of us to do so thanks to her latest book for eight- to twelve-year-olds: Just Breathe : Meditation, Mindfulness, Movement and More. Darrah Brustein: You learned to meditate at age nine and now are helping other kids and teens do the same. Why do you think it’s important to learn early, and what was the key for you to do so as a child yourself? Mallika Chopra: Meditation was the most precious gift my parents gave my brother and me when we were young. Meditation nurtures inner calm, self-regulation, and focus. If children can learn early how to have more control over their reactions and process their feelings, they will have tools for life that will support them to enjoy the good times and get through the tougher ones. My intent in writing this book was to empower kids directly to experiment and discover these tools. For me, meditation has been an on-and-off journey, but because I learned so early, I could tap into these techniques at different stages in my life. Brustein: You lay out four core principles which are: meditation, mindfulness, yoga and motivation. What are they, why are they important, and how do they work together? Chopra: Meditation helps you quiet your mind, and mindfulness helps you become more aware of your thoughts, body and surroundings. Yoga uses your breath and movement to let go of tension, relax, stretch and be more connected to your body. And motivation uses positive thoughts to feel happier and achieve your goals. These techniques can be used together, but also at different times, they may be more effective. It’s important to remember that in wisdom traditions, meditation wasn’t used for stress management; rather it was a way to connect to ourselves and our surroundings and think about our role in the universe. That is why I feel passionate about using self-reflection, questions, gratitude and intention in our daily practices. Brustein: What do you suggest is the first step for an adult to help her child begin to meditate? Chopra: I feel strongly that we should never force our kids to meditation. Rather we should find our own practice as adults, and explore our own needs, intentions, and aspirations. Our children are watching us, and if they see that we are discovering more peace and purpose, they may be intrigued. Also, with this new generation, so many of them are exposed to breathing and movement practices in school or through sports, so we can learn from our kids. Hopefully, Just Breathe can be an additional complement to kids discovering and sharing these techniques. Brustein: You share about the importance of intention. Please share further with our readers about that and some examples. Chopra: Intentions represent who we aspire to be as individuals, members of our family, and citizens of Mother Earth. Intentions come from our soul, from that deep place when we ask ourselves, “Who am I, what do I want, and how can I serve?” Intentions are different from goals, which come from the mind and often are more task-oriented. If we focus on our deeper intentions first, then executing goals becomes easier because we know why we are doing what we do. Brustein: How does stress show up for kids, and what are some results of it? Chopra: Kids today are bombarded with stimulants, whether it’s from family, friends, school, outside forces, or social media and a constantly ‘on’ environment. It is hard to find quiet time, to just pause and ‘be’, rather than ‘do’ all the time. Today, more and more kids are facing anxiety and attention deficit disorders, and I believe that even simple breathing exercises to slow down can give kids a needed moment to decompress. Brustein: What specifically is the value of meditation as it pertains to decreasing stress? Chopra: In the last twenty years, there has been a lot of research around stress and meditation. When my father began talking about the mind-body connection thirty years ago, some may remember he was considered fringe. On a physical level, meditation decreases cortisol and other stress hormones, and gives the body and mind more rest to recover from daily stimulation more effectively. Brustein: How and why do you suggest habit formation around these practices? Chopra: As we build habits, we clear the path to make practices easier. With meditation, the first step is to let go of having any expectations during your practice, and let every meditation be what it is meant to be. That means sometimes you sit there with constant thoughts, sometimes you fall asleep, and sometimes you connect in a meaningful and healing way. With practice, you learn that each meditation gives you what you need at that moment. Brustein: Can you walk us through one of your favorite exercises to help kids begin to meditate? Chopra: For kids, keep it really simple. Just begin with a deep breath. Breathe in to the count of three. One. Two. Three. Pause. And breathe out to the count of four. One. Two. Three. Four. Breathing like this several times a day is great for both kids and adults. Brustein: I love that you offer a variety of meditations for different circumstances like sleep, pain, headache, or cooling down. How do meditations vary to address different practical challenges like these? Chopra: There are rich traditions and science of different practices across wisdom traditions across the world. Using different sounds taps into different vibrational energies, as different moments stimulate different nerves or parts of our bodies. My goal was to present these practices as simply as possible to kids so that they can get the benefits. Brustein: You make mantras accessible for kids. How can a child ‘find his word’ and what’s the value in doing so? Chopra: ‘Mantra’ in Sanskrit means ‘tool of the mind’. There is a rich tradition of mantras, and specific mantras that have been used for thousands of years for different practices. But, to begin, asking kids to come up intuitively with a word that comforts them is a personal and special exercise. Mantras feel more personal over time, and empowering kids to choose their own is powerful. Brustein: You share an exercise about noticing your words and thoughts. Can you elaborate on this for our readers? Chopra: Our internal dialogue affects our external reality. I realized a few years ago that my internal dialogue was always, “I am tired. I have too much to do. I am stressed and overwhelmed.” And by constantly saying this to myself, I was living that way. As I shifted my inner talk to focus more on gratitude and positive messaging, my life began to shift. Brustein: “Who am I?” can be a tough question for an adult, let alone a child. In your book you share about the discovery of that. Can you talk about that, please? Chopra: At different times and in different places, each one of us answers this question differently. For example, today I can say I am a mother, wife, daughter, sister, author, speaker. I can also say I am Indian, American, brown, a Bostonian who lives in California. But as I keep asking the question, I can experience that who I am inside is different from just the labels. And that I keep experiencing different things. I am also kind. I am confused at times. I am happy. I am angry and frustrated. For kids, realizing that they are not defined by being a soccer player or a musician, or by their feelings and insecurities, is an important life lesson as their labels and emotions will keep changing and evolving. Inner knowingness is very powerful. Brustein: Some mistake self-care as self-serving. However, you point out that it’s not, and encourage your readers to ask “How can I serve?”. Tell us about the connection here. Chopra: In my meditations, I often break down “How Can I Serve” into “how can I serve myself”, and then “how can I serve my community and my world?”. If we don’t take care of ourselves, especially as parents and caretakers, then we suffer and don’t serve others to the best of our abilities. Also, as we are honest with ourselves about the best ways to nurture our body, mind and soul, then I believe we can serve others more authentically. Brustein: You write that after doing the exercises in the book and understanding the power of one’s thoughts, kids are on the path to create the life they want. Please share more about that.